Peranakan cuisine remains overlooked by travelers, who come in search of pocket-friendly street food or buzzy new restaurants. A shame, seeing as one of Asian’s oldest fusion cuisine… and arguably the finest. Good Peranakan food offers a complex taste, love, labour, patience and harmony of different colours and textures. This is present in the food prepared at BabaNyonya, a quaint little shop, a small hole in the wall at Taman Samarak, Nilai that serves amazing and authentic Peranakan cuisine. We went for lunch around 12 and the place filled up pretty quickly. Most of the customers here are from the industrial zone nearby. Malay customers came in droves as this place serves HALAL food. The restaurant is simple yet comfortable, not overly decorated but functional and clean, fully air-conditioned. The only drawback is the space is quite restricted and won’t be able to accommodate a large crowd. Max 10 tables. Sambal Ikan Bilis with Petai @ RM 16.00 (s) ~ Whatever you order, don’t leave out this dish, as they are one of the best I’ve tried. The stinky beans are best cooked in a spicy sambal paste, paired with crispy fried anchovies and cubes of cooling cucumbers. I know petai is an accquired taste, but trust me, this dish is inviting with mouth watering experience, to say the least. Kangkong Belacan @ RM 12.00 (L) ~ For fibre, the kangkong belacan however was slightly off the mark, diluted and tasted rather bland. A bit of a let-down here. 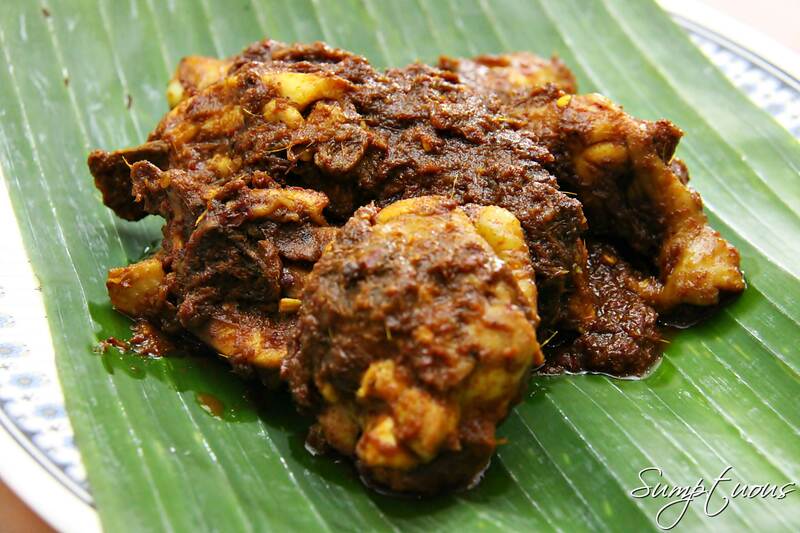 Nyonya Rendang Curry Chicken @ RM 20.00 (L) ~ Rendang chicken – one of my favorite Nyonya dishes was another treat on it’s own. The gravy was really thick and lovely which turned out to be absolutely delicious! The meat was tender and every bite was infused with the lovely spices. Nyonya Rendang Curry Mutton @ RM 30.00 (L) ~ As far as my taste buds are concerned, I think that mutton and curry are a match made in heaven. The deep flavors and lingering heat of the mutton curry here is a testament to the unique rendition by the chef. It was not overly spicy, but the combination of lemongrass, kaffir lime leaves and fresh turmeric in his version were bursting into flavors in each mouthful. 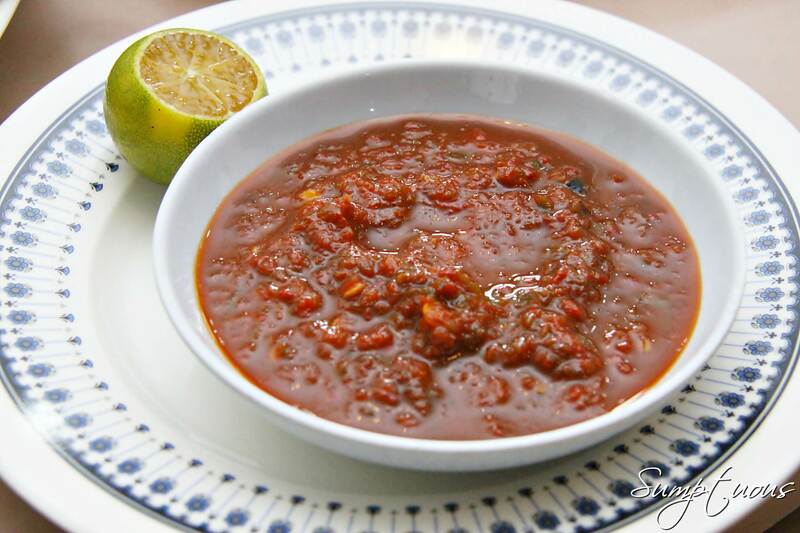 Sambal Belacan ~ if you truly love spicy hot chilli belachan with lime, you should try it out here, but to my disappointment, the belacan was a complete letdown today. The presence of water taste is very very strong. BN is easy to sight as it is along the main road of Nilai. It’s striking red colour signage is not one that can be easily missed. Parking is also easy here, but reservation is a must, especially during lunch hours. If you have only one chance to eat Peranakan food while in Nilai, just head to this restaurant. It will not disappoint . This entry was posted in Kangkong Belacan, Mutton Curry, Nilai, Nyonya, Nyonya Rendang Chicken, Nyonya Rendang Kambing, Sambal Ikan Bilis, Sambal Petai, Seafood. Bookmark the permalink.